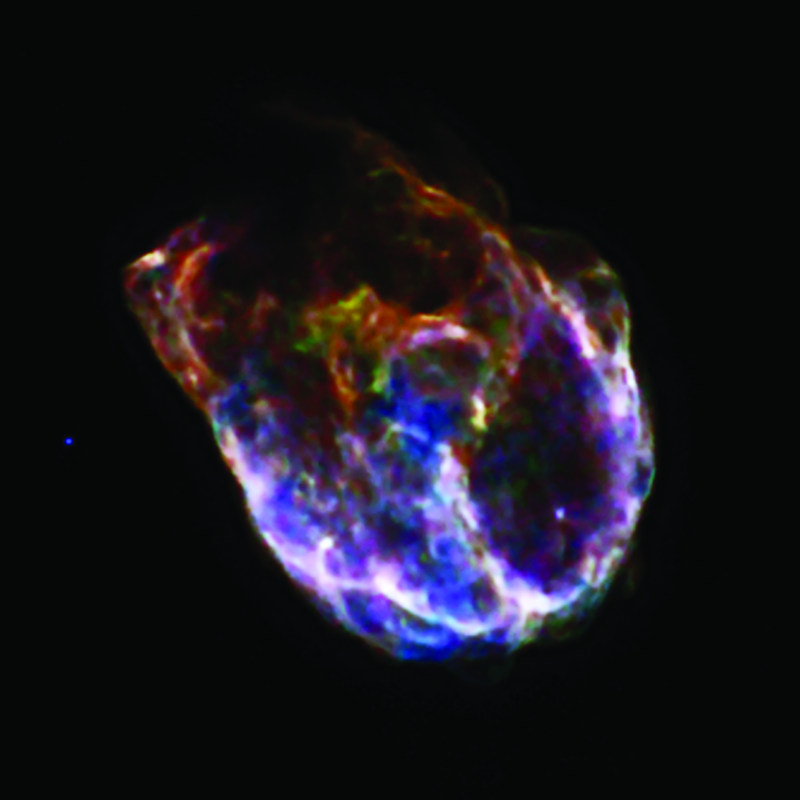 This Chandra X-ray Observatory image shows the debris of a massive star explosion in the Large Magellanic Cloud, a small galaxy about 160,000 light years from Earth. The supernova remnant (SNR) shown here, N132D, is the brightest in the Magellanic clouds, and belongs to a rare class of oxygen-rich remnants. Most of the oxygen that we breathe on Earth is thought to have come from explosions similar to this one. The colors in this image show low energy X-rays (red), intermediate energy X-rays (green) and high energy X-rays (blue). Substantial amounts of oxygen are detected in this image, particularly in the green regions near the center of the image. The location of these oxygen-rich areas, detected in the Chandra image, is generally well matched with the oxygen-rich areas detected in Hubble Space Telescope images (not shown here). However, the expanding, ellipse-shaped shell of oxygen seen in N132D is not seen in either G292.0+1.8 or Puppis A, two oxygen-rich SNRs in the galaxy with similar ages to N132D (about 3,000 years, ten times older than Cas A). 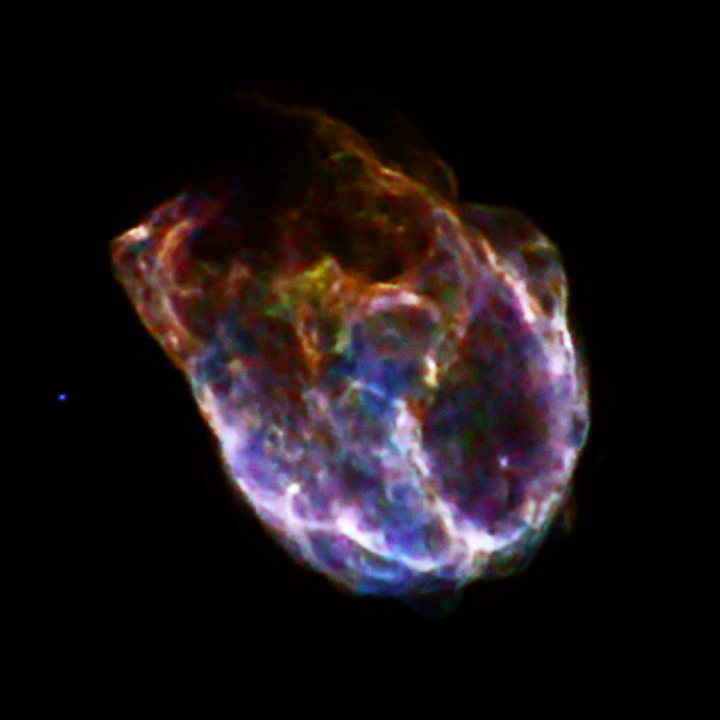 The origin of this shell is unknown, but it might have been created by a `nickel bubble' shortly after the supernova explosion, caused by radioactive energy input from nickel that was created by the explosion. The existence of such bubbles is predicted by theoretical work. The ultimate goal of these observations is to constrain the mass of the star that exploded and to learn more about how massive stars explode and spread heavy elements like oxygen into surrounding space. Scale Image is 2.9 arcmin across. Coordinates (J2000) RA 5h 25m 2s | Dec -69° 38´ 59"